360° PREVIEW - YOU'LL 'LIKE' THIS! Facebook has recently enabled the use of 360° images and a full tour can also be posted. Because Facebook acts on a time line it can be more advantageous to post two or three related scenes from your tour letting your followers see your tour over a period of weeks or months. We enable the 360° scenes with the appropriate metadata for viewing on Facebook. The 360° YouTube video can also be used on Facebook and it is often best to post this first, delivering the overview, which then can be explored in more detail when you post the 360° scenes at a later date. The secret with social media is to unpeel the onion slowly not just cut it in half. You can also post a You Tube video on Twitter and Instagram. We have used Facebook for a number of years as it is a great social media platform to communicate with our customers who are predominantly young boys and girls. In the past we have used still photos to communicate our special sales offerings however, over the past 6 months I have observed a greater use of 360° images. I decide that I wanted to give this a try. I engaged 360° Preview to undertake this work for me. I initially posted my full virtual tour and it immediately gained 1300 viewing. 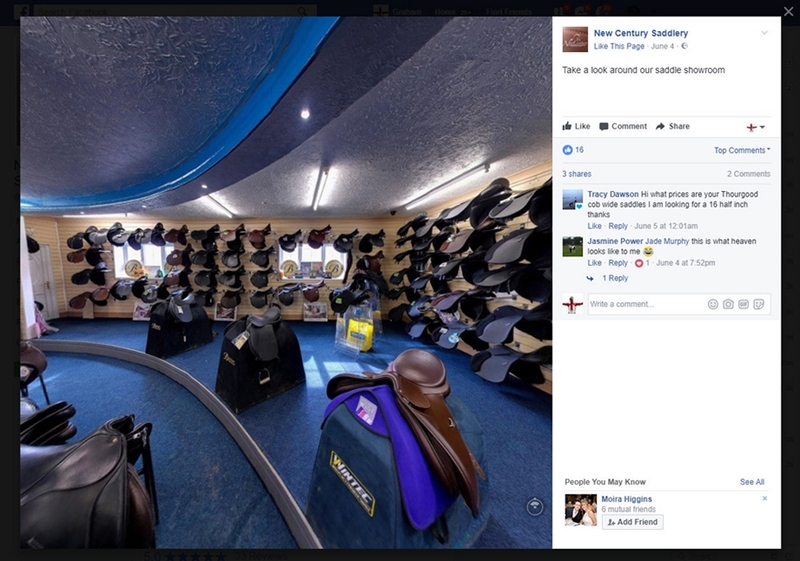 I was pleased with this however, because my virtual tour of our Equestrian shop has 28 scenes I was conscious of the fact that many would not view the full shop. I decided to post the one scene of our saddle floor linked to a sales promotion. I was taken aback with the result of 3,014 people viewing the posting which was a direct result of acquiring a lot of likes which extends your audience beyond your initial customer following. Conclusion - I am going to individually post all of my shop scenes linked to special offers. I am sold on 360° images and the ability to zoom in on products of interest.